The AR.Drone has been quite a fun since its release two years ago, despite being quite expensive ($299) for the ordinary hobbyists. The Pizza box-sized drone by Parrot has been a testing gadgets for the enterprising pilots, who can fly the drone even through their iPhones and spying the neighbourhod on their iPhone screes LIVE. 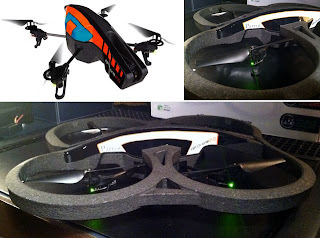 AR.Drone 2.0, recently unveiled at CES 2012, still costs $299, but is now stuffed with far more pro-level features and even offers a somewhat sleeker and, according to Parrot, more resilient design.